Sometimes things were not meant to be. Case in point - we've been trying to eat at Bistro Wagon Rouge for almost a year to no avail. First time, it was after hockey and Gadget Girl changed our destination on us. Second time, it was closed. Third time, the wait was too long. Fourth time, Whipping Girl was sick. Despite her insistence that we go without her, Miss Y, Ned Flanders and myself changed our plans instead. 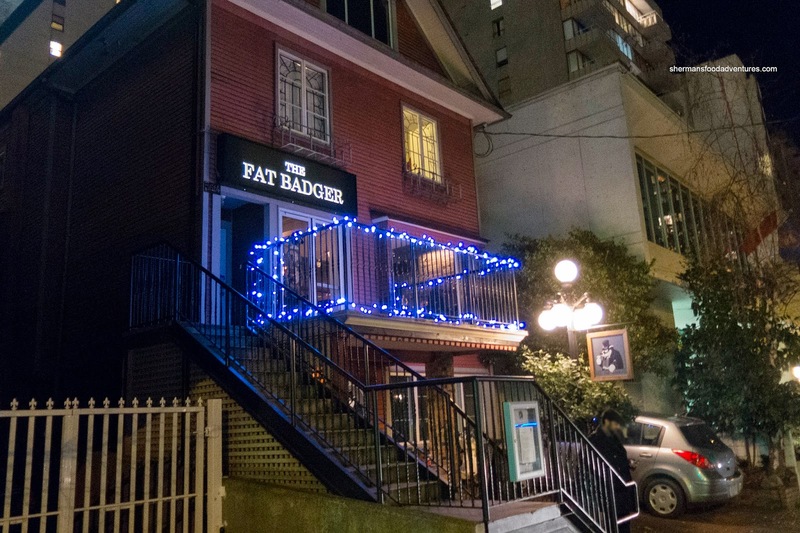 Up next on our bucket list was The Fat Badger in Downtown, where British pub eats awaited us. ness (that's not a word is it?). When we finally did arrive, we got down to business and ordered far too much food for 3 people. 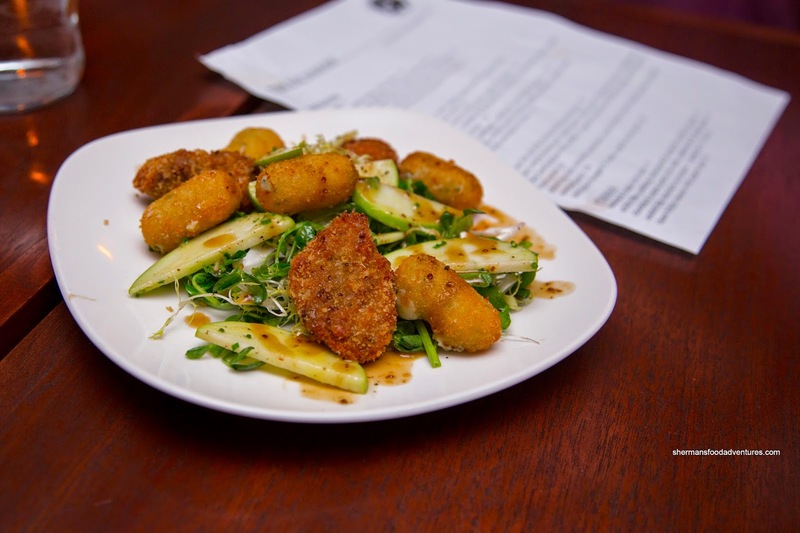 We began with the Fried Pork Cheeks with cheddar & spring onion croquettes, watercress, frisee and apples slices drizzled with a warm cider & mustard sauce. Tender, moist and strangely beef textured, the pork cheeks were encased in a crunchy breading. The croquettes were really good with a soft centre and slightly crispy shell. With greens on the plate and a mildly acidic dressing, the heaviness was shaved down a few notches. 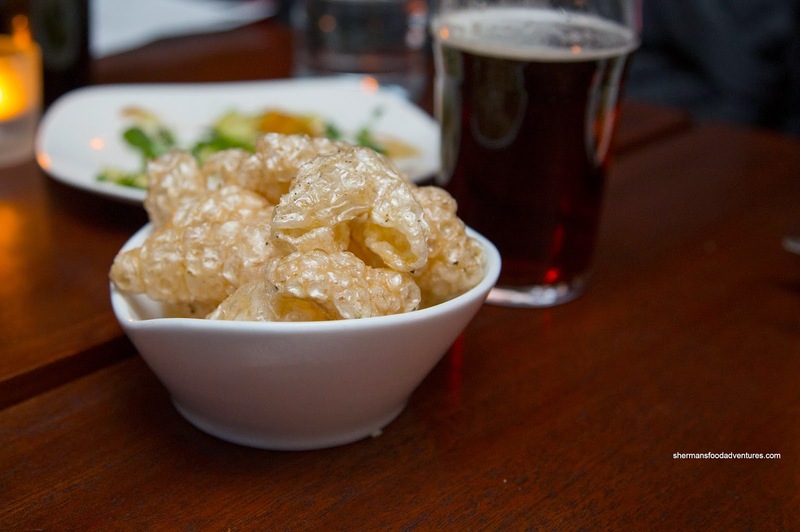 To go with our brews, we got an order of the Pork Cracklings with sea salt & cracked pepper. Although I've had airier, these were still light and crispy with just the right amount of seasoning. 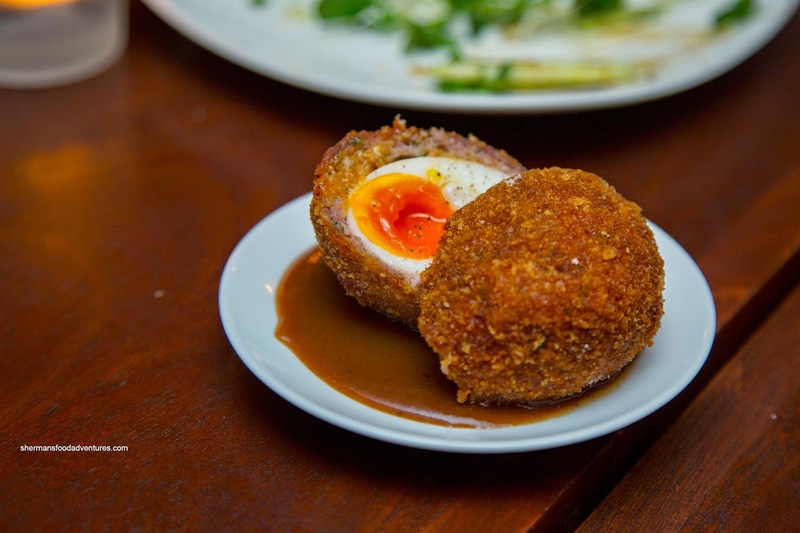 Next up was a Scotch Egg atop HP Sauce. Funny enough, I had exclaimed that the sauce underneath bore a striking resemblance to HP Sauce. Ned Flanders replied that it was indeed HP Sauce. Okay, I guess that is why it tasted like HP Sauce... Duh. Well, that was probably the reason why we didn't get a whole lot of impact from the sausage. It was moist enough, but we didn't taste a whole lot of meat (possibly from us dunking it into the HP Sauce). As for the egg, it was nicely executed with a beautiful free-range yolk. 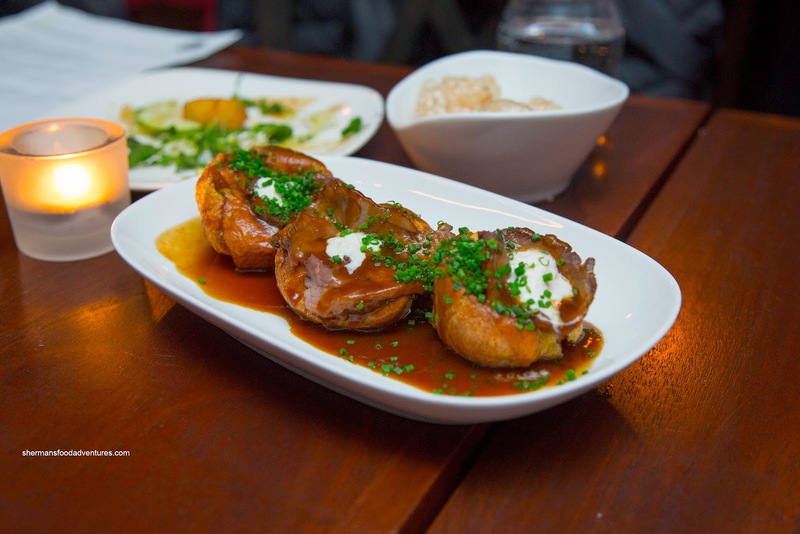 Completing our "appies", we had the Mini Yorkshire Puddings stuffed with roast beef, gravy and horseradish cream. We liked the pudding itself as it was light, soft and airy. However, the roast beef was slightly chewy. Gravy was nice where it was meaty without a boatload of salt, yet the horseradish was too mild to be heard. 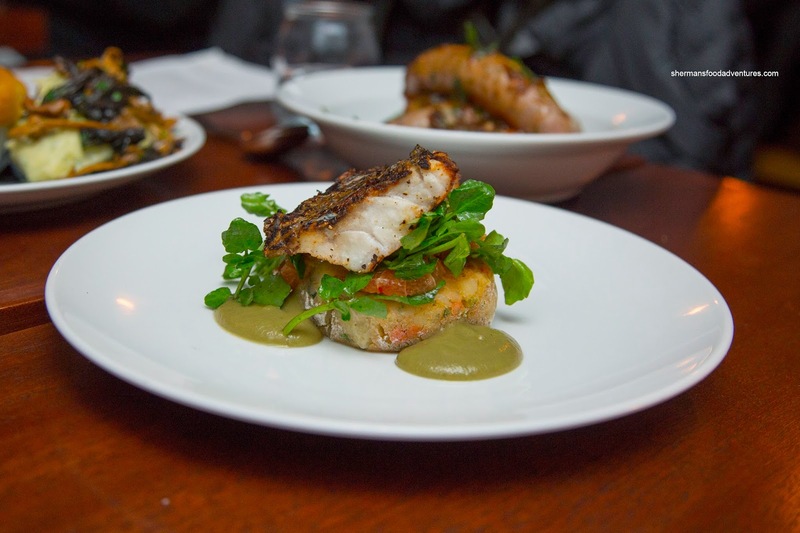 Moving onto some larger items, we tried the Grilled Local Sea Bass with bubble n' squeak, watercress & blood orange salad with caper & raisin sauce. Nicely crisped, the skin was the highlight of the dish. As for the fish itself, it wasn't as buttery and flaky as we would've hoped. I did like the seasoning as it was there without being overwhelming. The bubble n' squeak was soft while not mushy where it had a nice acidity from the blood orange. What really brightened up the flavours was the caper and raisin puree as it was acidic and sweet. Probably our favourite main of the night was the Steak & Ale Pie with champ and mushrooms. Beneath the flaky and buttery crust, we found a thick gravy that featured the depth of ale without the bitterness. The sparse speckling of meat was succulent and rich in taste. The side of champ was buttery and good on its own. On the other hand, mushrooms added more depth-of-flavour. 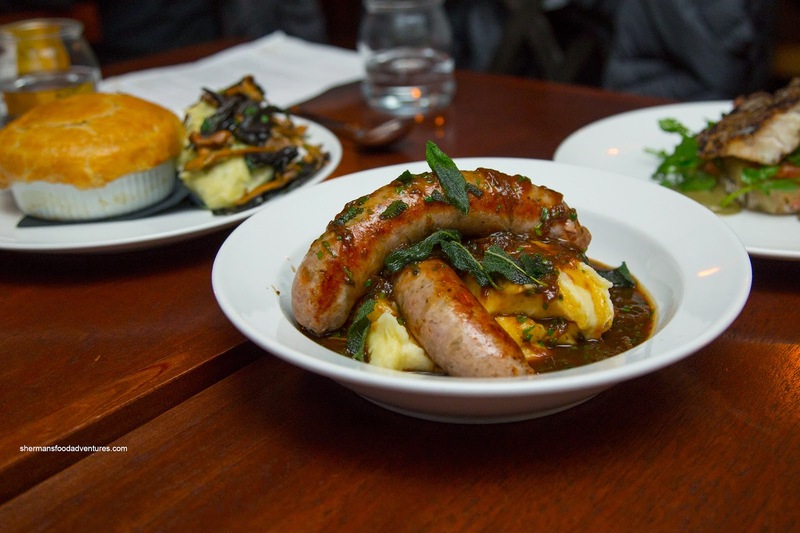 Our last entree was the classic Irish Porter Bangers & Mash with sage and onion gravy. Yes, the portion size was as large as the picture illustrates. The 2 large sausages were not as heavy as they looked. Inside, the lightly chopped meat was mixed with a good amount of chunky onion which added sweetness along with a looseness that made the sausage easy to eat. I found the onion gravy to be excellent as it offered up both a tang and sweetness to balance off the savouriness and sage. Underneath, the mash was buttery and smooth helping soak up the rich flavours of the gravy. 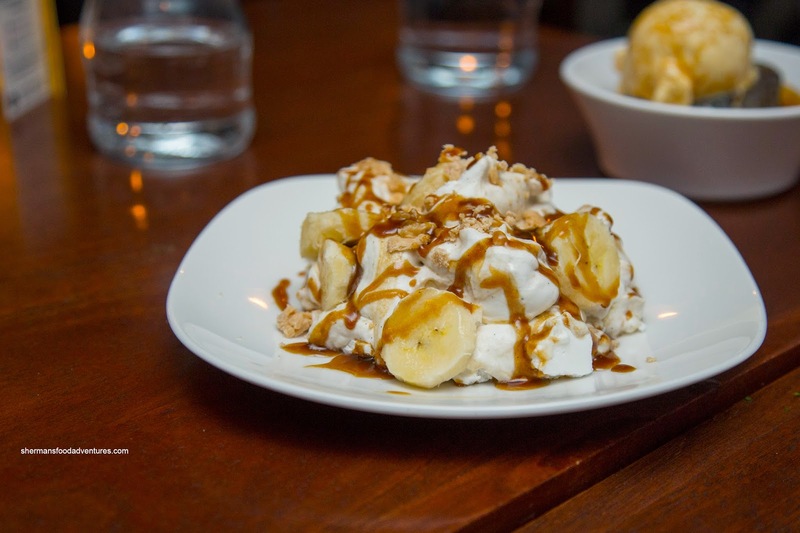 For dessert, we shared 2 of them including the Banana & Fudge Eton Mess with little nuggets of meringue hidden underneath the cream. I would say I was indifferent with this dessert as it was really sweet and lacking in differing flavours. I did like the meringue though as it was a textural contrast to everything else. 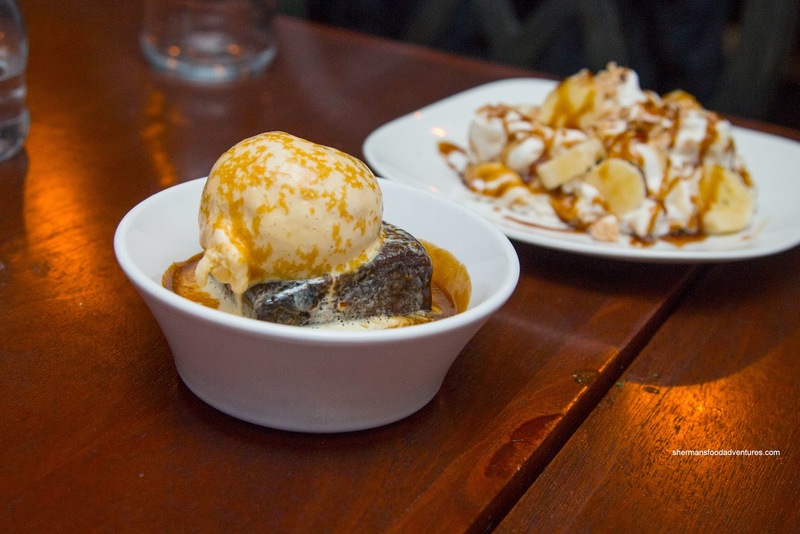 As for the Sticky Toffee Pudding with vanilla ice cream, it was love at first bite. The toffee pudding was moist, rich and sweet. Although it was still quite sugary, it wasn't any different than other versions I've had. To top it off literally, the melting ice cream added more sugary goodness. Surprisingly, we dusted off all of our food with barely anything left on our plates. Overall, we quite enjoyed the food we tried. Sure, it wasn't perfect, but nothing ever is. 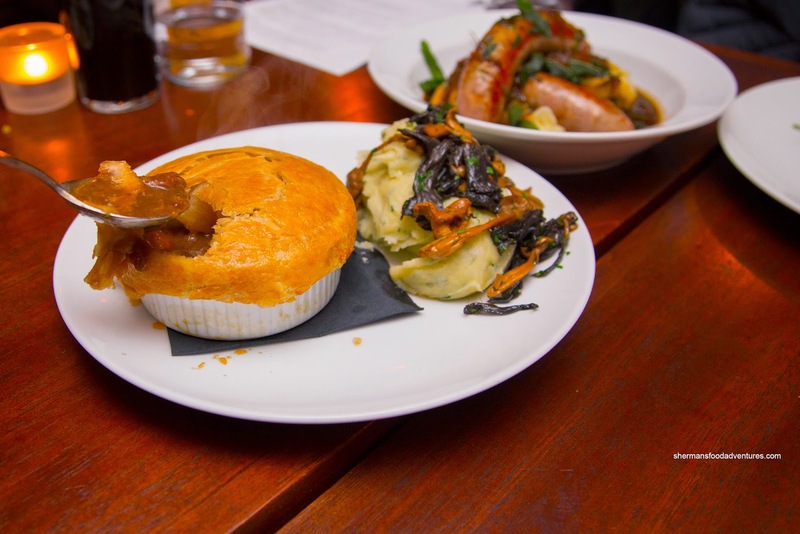 The Fat Badger, in our minds, successfully serves up a more refined British pub food experience. - Squishy and tight in there, but hey, it's the pub-like experience right?